There was no milk for breakfast this morning. I'm happy to say that this doesn't often happen in our house - but that does then mean that it's even more ruinous to the morning routine. The First-Born kindly went to the dairy when it opened and brought some back, but by then the pattern was shattered and the day already dislocated. Breakfast to me is tea and cereal, currently porridge, both with lots of milk. To do without it was to re-live some of the worst breakfasts I've eaten, most notably in Peru. 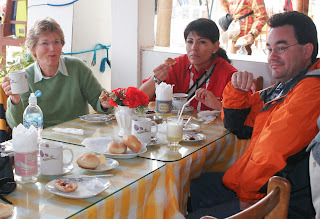 In our three-star experience there, breakfast was invariable: a saucer with one dry-scrambled egg on it, some slices of tomato, a sliver or two of avocado if we were lucky, and a stale bread roll with jam washed down with a cup of coca tea (or feeble coffee). Every morning, the same. It's just as well the country itself is so colourful and fascinating, because those breakfasts were nothing to get out of bed for. I've had other horrible breakfasts - the hard-boiled eggs and Fanta in a Moscow hotel are still memorable after 30 years - but there have been excellent ones too, even just this year. Duck hash at Hapuku Lodge in Kaikoura was inspired and delicious; and having the waiter on the Silverseas ship Silver Whisper trail behind me back to the table carrying my choice from the buffet was a novelty - but best of all was at Indigo Pearl Resort on Phuket, Thailand. The resort's decor is industrial chic - iron, concrete and bolts combined with super-fine sheets, silk throws and richly polished wood - which was a nice change from the usual bamboo. The restaurant kept the theme going with cutlery like spanners and so on, but it was the food that blew us away, especially the breakfast buffet. Every sort of tropical fruit, juice, cereal, pastry and bread, a toaster (yay!) and friendly staff standing behind little stalls just waiting to whip up our choice of eggs, or waffles, or crepes, or noodles, fried rice or congee... And tables outside under palm trees with manicured gardens full of bright waxy scented flowers, peaceful fountains and immaculate lawns. Now that's the way to start a day. Now I have always believed fried rice is a good choice for breakfast. What, no "Well I'll be - it's good ol' Chuck! Haven't seen him since college/Christmas/coffee break!"? He's from St Louis, you know.